In the summer of 2016, singer/songwriter Lindsey Jordan, then aged just 17, released the EP Habit, a handful of sparse, sometimes jangly, ofttimes forlorn tracks under the moniker Snail Mail. Between 2016 and 2017, Habit was in constant rotation in my tape player, its six tracks growing on me with each listen. I kept praying, please, don’t break up, please let there be a follow-up. The space between 2016 and 2017 was dreary and awful for a lot of us, and Habit quickly became one of the only things I could turn to when I needed to draw my mind away from everything. At the time it just felt so perfect. Fast-forward one calendar year and my feelings are the same, but I’ve been left wanting more. This month, Snail Mail return with their first full-length album, Lush, having signed with the legendary Matador Records. Jordan is joined by bassist Alex Bass and drummer Ray Brown. From what we heard on Habit, Jordan’s songwriting showed a natural propensity for both blissful, poppy tunes and scant, introspective numbers, and just as Habit lent favor toward the latter, Lush does the same in Jordan’s now-familiar pragmatic, casual and languid manner. After a brief, ingénue intro track, the album’s first single, “Pristine,” comes into focus, Jordan’s steady voice accompanying the rhythm section as she moves deftly between chords, tranquil as she laments, “And if you do find someone better / I’ll still see you in everything tomorrow / and all the time.” This mood and subject matter is one comforting certainty that Snail Mail offers us. “Don’t you like me for me? Is there any better feeling than coming clean?” she continues, the album’s lyrical content staying humble and vulnerable, never waxing poetic or overwrought. “Heat Wave,” Lush’s fourth track, begins in somber fashion with Jordan sorrowfully singing, “Woke up in my clothes / Having dreamt of you,” before an almost Nels Cline–sounding fuzzy lead breaks through the fog and the track finds its tempo. “And I hope that the love that you find / Swallows you wholly / Like you said it might,” she sings defiantly, but with an air of acceptance, before ending with the words “I’m feeling low / I’m not into sometimes.” Such sparse and real lyrics checker the album, making Lush instantly relatable and accessible, with Jordan seemingly keeping no cards hidden, but delivering experiences in a subtle and spare manner. Lush’s fifth track, “Stick,” is the only song carried over from the album’s two preceding EPs, and is revisioned simply and beautifully. 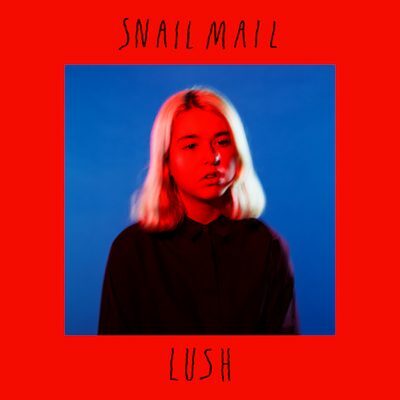 Lush treads the same ground as Snail Mail’s Habit and Sticki EPs, but was produced and recorded perfectly. Where most artists would naively opt for overproduction and enhanced theatrics after signing with such a large and prolific label, Snail Mail instead retain their unique voice and character. Jordan’s voice is brought foremost into the mix while her guitar, sometimes swirling and other times pensive, sits just below with the rhythm section, tastefully threaded as the backdrop for the album’s 10 tracks. “Golden Dream,” the seventh track, begins with the promise of another bedroom pop masterpiece much akin to “Pristine,” but is broken up sporadically with a whirling chorus before ending abruptly at the track’s climax. The following tracks follow familiar patterns: A mix of upbeat pop numbers delicately mixed with slower, cathartic songs.